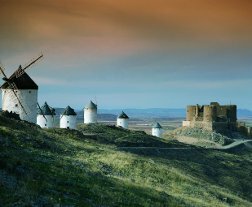 Castile–La Mancha is also home to a whole host of traditional celebrations such as the Corpus Christi in Toledo, Easter Week in Cuenca, the Albacete Fair, and the Drum Festival in Hellín. And as befits a land of traditional customs, it also produces a variety of typical gastronomic products such as honey from La Alcarria and marzipan from Toledo, as well as being the site of numerous wineries where visitors can enjoy tasting a range of wines, including Valdepeñas. Bon appétit!